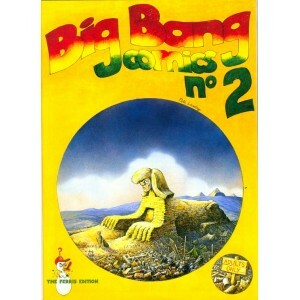 Big Bang comics were the creation of unique artist Pete Loveday. Since 1981 he has drawn many comics that have now been collected into three big compilation graphic novels, all following the exploits and madcap adventures of Russell, the well meaning hippie hero who just can't get any peace or stability into his life . Pete has an excellent graphic style- as evinced in his drawings produced here -and he also displays a wicked sense of humour and keen observation of 'alternative culture ' architypes and sub cultures which he puts to great use in his comic strips . In particular he excells in depicting the free festival and alternative Festival scene . In Russell , The Saga of a Peaceful Man part 2 , our hero jouneys to the Glastonphast festival in order to make his fortune selling cardboard bog seats to the masses ,needless to say he does NOT make any dosh, but he does provide us with many hilarious incidents on the way and I can definitely recommend that you score yourself a copy of the mag and the others as well. Below is a further example to give you an idea of what to expect . More drawings are spread out over the free festival web site, and all will link back to this page, where you can order copies of the mags if you look below .